There is a longstanding debate regarding the role of white folks in the struggle for racial and economic justice. Should they be part of strategic decision-making? Should they always be there with us, standing side-by-side, in marches and acts of civil disobedience? I may not have the right answers to these questions, but there is one important lesson that I have learned from the work of previous generations –– we cannot do it alone. On May 16, PBS aired Freedom Riders, a documentary chronicling six months in 1961 when young activists embarked on the “Freedom Rides,” challenging Jim Crow laws in the Deep South. Organized by the Congress of Racial Equality (CORE), the Freedom Rides were intended to bring attention to the discrimination endured by African-Americans when they traveled by bus or train, despite the Supreme Court rulings outlawing segregation, and to mark the anniversary of Brown v. Board of Education. We are taught in school that the Kennedys played an important role in the civil rights movement, however we learn from the film that they were, in fact, reluctant to delve into the issue at the time. The United States was in the middle of the Cold War with the USSR and the Kennedy administration’s priority was to prevent nuclear war and “spread freedom throughout the world.” The Civil Rights movement was considered a nuisance to the administration. How could we spread “freedom” throughout the world when people of color in this country weren’t even free? It was this hypocrisy of the federal government, along with the daily dangers faced by African-Americans throughout the country, and particularly in the Deep South, that compelled thirteen people, both black and white, to make the journey from Washington, D.C to New Orleans. But not everyone in the struggle thought that this was the most strategic action to bring awareness to the issue of segregation in the South. Some people thought it was too confrontational and risky. But, when you are already an oppressed people, what more is there to lose? Once they crossed into Alabama, the Freedom Riders were met with fierce opposition. A bus was firebombed in Anniston, almost killing them all. John Patterson, who was then Governor of Alabama, initially did nothing to protect the riders, labeling them as agitators. The hope was that if the riders were emotionally and physically broken down by angry white mobs, the movement could be quashed. James Farmer, CORE’s national director, as well as other riders did contemplate ending the rides, especially after altercations reached a new level of violence in Montgomery, Alabama. But student activists from Nashville, Tennessee, led by a 19-year old Diane Nash, organized to continue the fight. Sir, you should know, we signed our last wills and testaments. 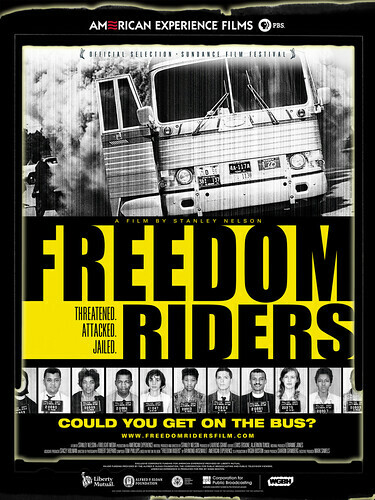 All the Kennedy Administration really wanted was for the Freedom Riders to give up. The altercations between the riders and the mobs had captured world-wide attention to the level of injustice in the United States. But, despite bomb threats at airports and lockdowns at churches, the movement persisted. All in all, between 300 and 400 people participated in the rides. Many of them spent time at the infamous Parchman Prison, outside of Jackson, Mississippi. After almost six months, the Interstate Commerce Commission (ICC), ruled that segregation on buses and trains was illegal. What started off as a journey for thirteen naive and idealistic young people turned into a movement that set the stage for other victories in the struggle for racial justice in the 1960s. As I work side-by-side with individuals of different races, class, gender, sexual orientation, and legal status I am constantly thinking about what kind of action is necessary to create real transformative change. I ask myself if we are taking the right risks to challenge the status quo. At the end of the day, as society’s problems continue to impact communities of color the most, we need to be at the forefront of the movement that we are trying to build. That leadership role requires us to determine when it is appropriate to include white people in the fight. We are all harmed one way or another by living in a world where some suffer and others benefit. The Freedom Riders showed us that when people come together to fight racism at all costs AND they don’t give up, things can change. So, when is it appropriate to create multi-racial coalitions? Thanks so much to Gilda (for the Dr. Pop Blog) and Jackie Cornejo for the write-up on “Freedom Riders.” I was captivated by her description of the documentary and intrigued by the questions she raises. In particular: “As I work side-by-side with individuals of different races, class, gender, sexual orientation, and legal status I am constantly thinking about what kind of action is necessary to create real transformative change.” This seems to be the key question for progressives. As the nation’s first black President nears an agreement with Republican Party leaders that will abandon the government’s commitment to social programs won by the labor, Civil Rights, Women’s, peace, and environmental movements, the question of transformational change becomes paramount. Thanks for your response, Steve. I think the “post-racial” discourse that exists in our society as a result of having elected the first Biracial president has sidetracked us from what kind of change we want to see in the country because it took a multi-racial coalition to get him elected. Our current political climate illustrates that we have a long way to go, and in fact, some of the rights and benefits we’ve obtained in the last several decades have slowly been eroded over the last several years, which is even more of a reason to think about how we need to re-frame and re-organize our overall strategy to achieve real social change.